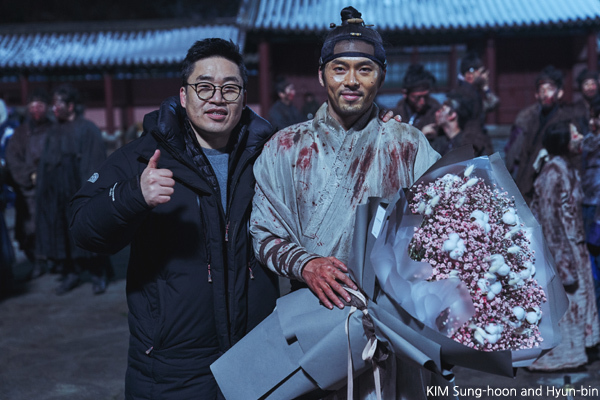 Korean period action film Outbreak wrapped up five and a half months of shooting on February 13th, just in time for the staff to enjoy the Lunar New Year holiday. The film sees KIM Sung-hoon and Hyun-bin, the director and star of last year’s Confidential Assignment (2017), team up once more on a big-budget production. Having kicked off photography in September, the production team of Outbreak benefited from a winter shoot to allow the cold weather to give the film a tense atmosphere. Set during the Joseon Era, the film details the struggles between a returning crown prince and ‘night demons’ that attack the kingdom. Hyun-bin co-stars with JANG Dong-gun (V.I.P., 2017) who will return to screens this month in Night of Seven Years, JO Woo-jin (Steel Rain, 2017), JUNG Man-sik (The Tiger, 2016) and KIM Eui-sung (1987: When the Day Comes, 2017). KIM and Hyun-bin encountered huge success last year during the Lunar New Year release window, when their North Korean spy action-comedy Confidential Assignment dominated the holiday period by attracting 7.82 million viewers (USD 58.92 million). Outbreak is currently in post-production and is being prepared for a theatrical release later this year, when it will be launched by distributor Next Entertainment World.